This past weekend, we did a quick remodel of our bathroom. My spouse repainted the walls, doors, and trim. He replaced the baseboard and the vanity, because water took a toll on our only bathroom, and the laminate started to come off the vanity. We have new baseboard that is a type of vinyl, but it looks like wood now that it is painted and caulked. My spouse is so handy from fixing everything around here that he works fast. The vanity and sink that we removed was donated to Stardust: Goodwill's version of a ReStore. The sink was in great condition. 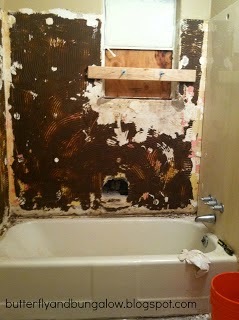 Almost three years ago, we redid the bathroom; it was quite horrible to begin with. 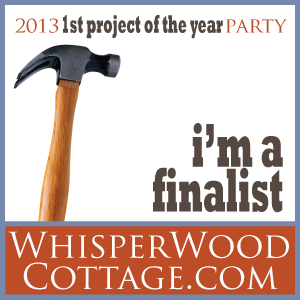 We did all the work ourselves except for fixing the plumbing. Fortunately, my sister lives about one minute away, (though about ten minutes to get into the place, because it is gated). The result then was nice too; in fact, it is one of my more popular posts. It is a 5 x 8 shoebox bathroom. At the time I liked the vanity because it fit well and looked good with the floor, but it was not "cottage like" because, I could not find a vanity with the correct width and depth that would work. I could not buy custom, so I settled. Recently, Ikea stocked one that had the look I was going for, and because it doesn't sit so close to the shower, and it's not laminate; it should last longer. At Home Goods I found a smaller storage cabinet with a marble top that has the same finish and reflects the style of the new sink console to hold the potions. Previously, our products were on a cart, but it was extremely messy and driving me crazy. 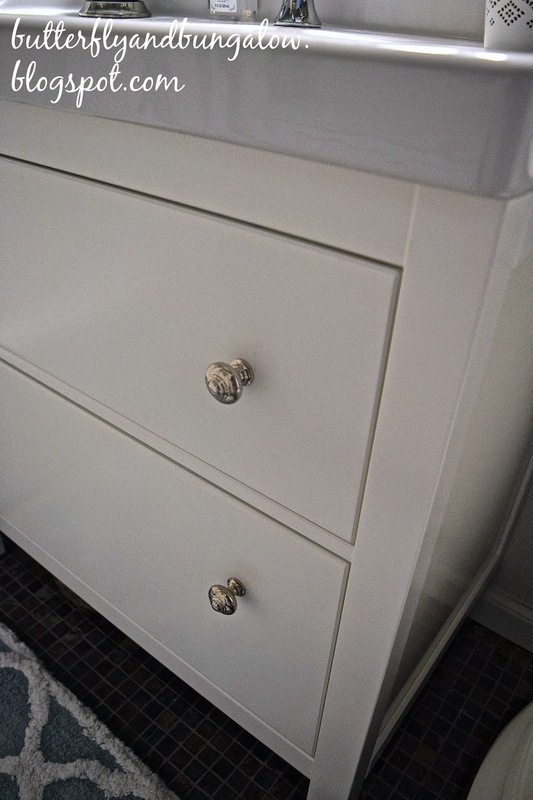 I replaced all the knobs on both pieces and the linen's closet with Martha Stewart knobs, which were much nicer than the ones they wore. What I like about the Ikea cabinet is that the plumbing does not take up space. 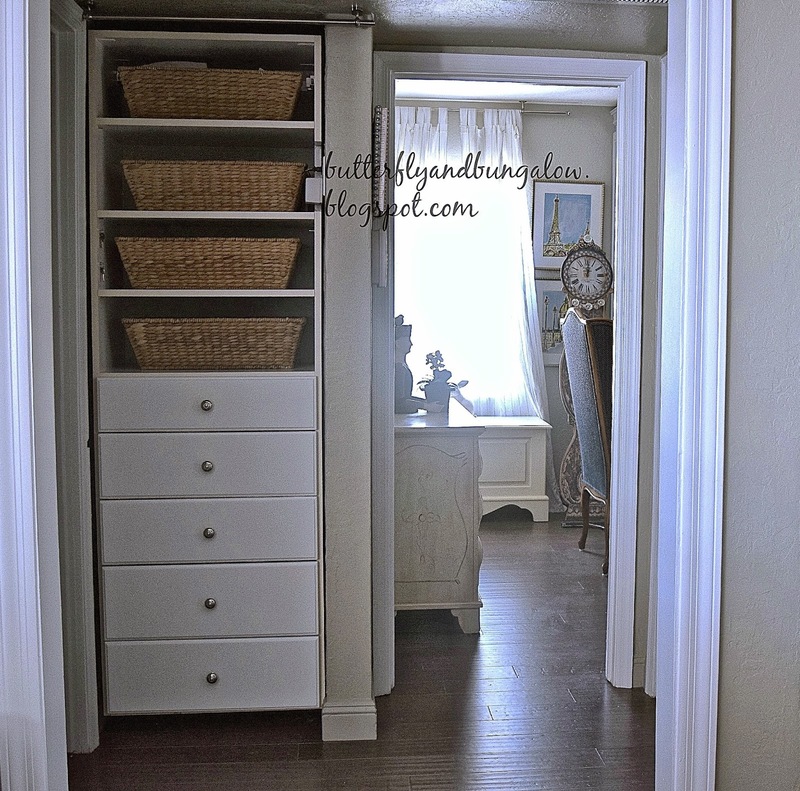 It sits flush against the wall, so that we have large roomy drawers to store things in their organizers that are made to fit the drawers precisely. Any bit of extra space, storage, or organization is so essential in a small bathroom, especially if it is your only bathroom. I rehung the same prints. Linen closet and Charging Station: This use to be a closet for a swamp cooler, but we removed it, because it smelled musty or worse even with special paint, and we installed an organizer. It had outlets, so we can charge the phones here, and a radio is hidden in a basket. The curtain is removed, so you can see the knobs now match the bathroom. I found the baskets at Pottery Barn about six months ago. We are really happy with the new white vanity look. 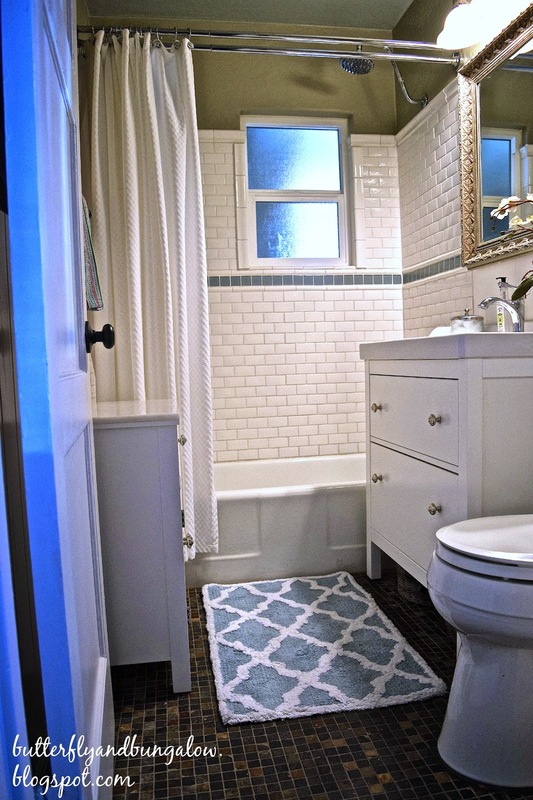 My daughter said the bathroom looks coastal, because the changes look pretty with the aqua glass tiles and the slate floor with accents of aqua slate that we installed previously. I absolutely love this! Clean, fresh, heartwarming and organized. Beautiful! Thank you, Linda. Have a beautiful weekend. Thank you, Diana. I think this vanity will last longer. Thank you, Cindy. I just wanted to keep it simple and white, because the bathroom does not get a lot of light. It looks really great and cottagey to me. 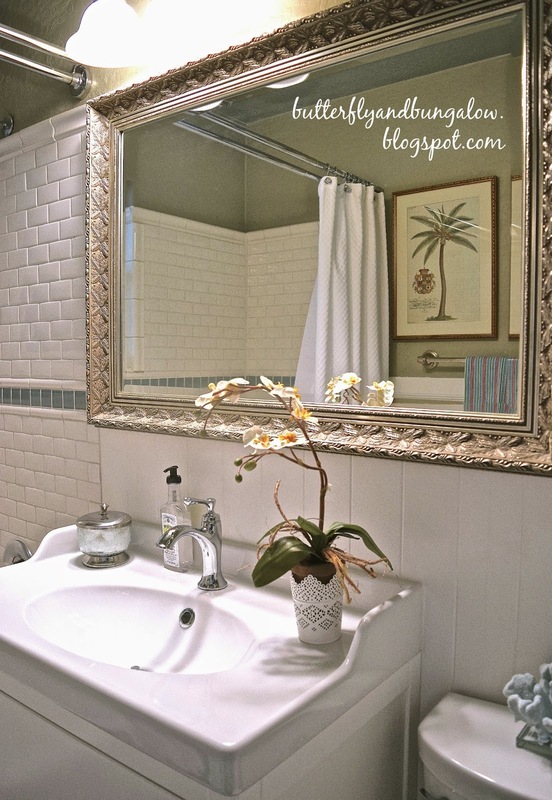 It has inspired me as I also have a shoebox bathroom which definitely needs a budget makeover! I love how those tiles look against the wall colour, really classy. This is gorgeous! Everything is seamless. You have a talent. Seeing your redo was a gift - a peaceful, serene scene before my hectic day begins. I'm guessing that's how this new bathroom makes you feel as well. 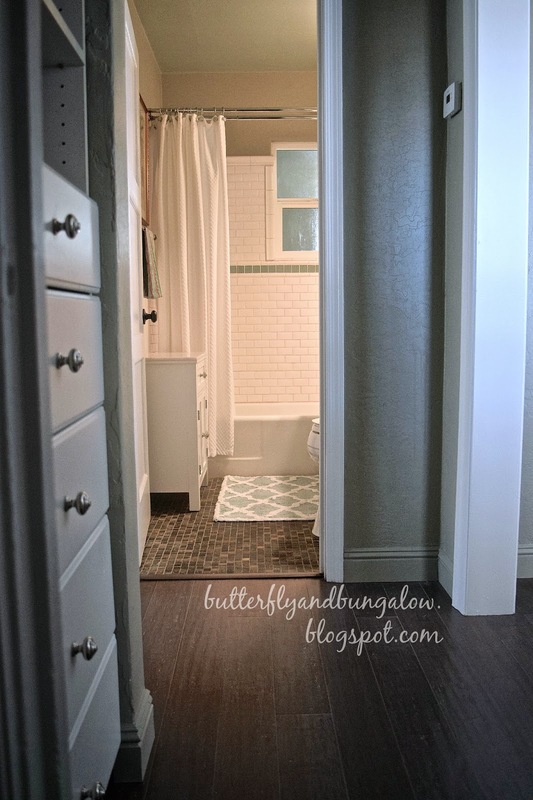 I love the expression shoebox bathroom and yours is really extraordinarily remodeled with great and essential cabinets and décor in soft, calming and relaxing colors! Thank you, Little Treasure. I hope you are enjoying your vacation! Great makeover! I love the brightness of your bathroom. Sempre me agrada um ambiente clean! Super cute! I love the shower curtain too! Great job on the makeover, you must be thrilled! Thank you, Anne. It looks so much cleaner and more similar to the rest of the place. Fresh and clean. It is perfect. I love the look of the tiles floor too. It gives the room more character. 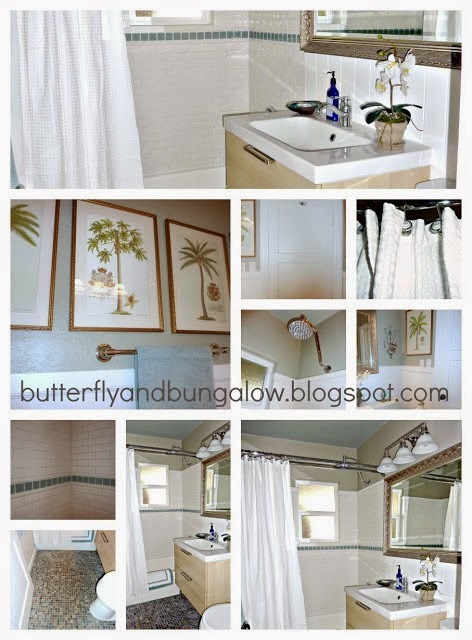 Whether coastal or cottage, one thing's for sure: your new bathroom remodel is very pretty! Kudos for doing most of the work yourselves; it's fresh and fabulous! Thank you, Poppy. My spouse is so good with tools. Su, Your husband rocks - accomplished all the redo in record time! Your linen closet is pretty and organized. You lucked out finding PB baskets that fit perfectly. How about "cottagey" with a costal vibe! 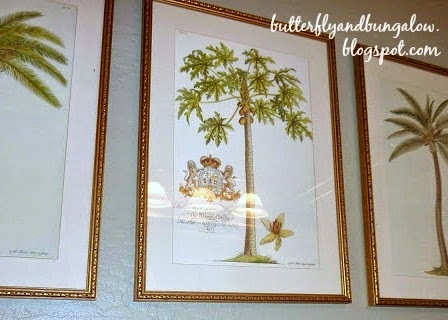 Looks pretty, I like a trio of prints being hung and the pictures add to the "beachy" feel. Thank you, Vera. He does. I've had those prints a long time, and I love them. There are four of those prints, but it is hard to show the fourth; it makes a turn, and they are all lined up covering the little bit of wall like a pretty box. Thank you, DD. It's wonderful that he is so good with tools. I can't believe what you have done with a typical older Phoenix home. It's just beautiful! We live on the west side in Peoria, and my daughter is buying her first home here which also needs some work, but after seeing what you have done with your home, I'm not put off by it. I believe it can be turned into something lovely just like your home. Thanks for the inspiration. 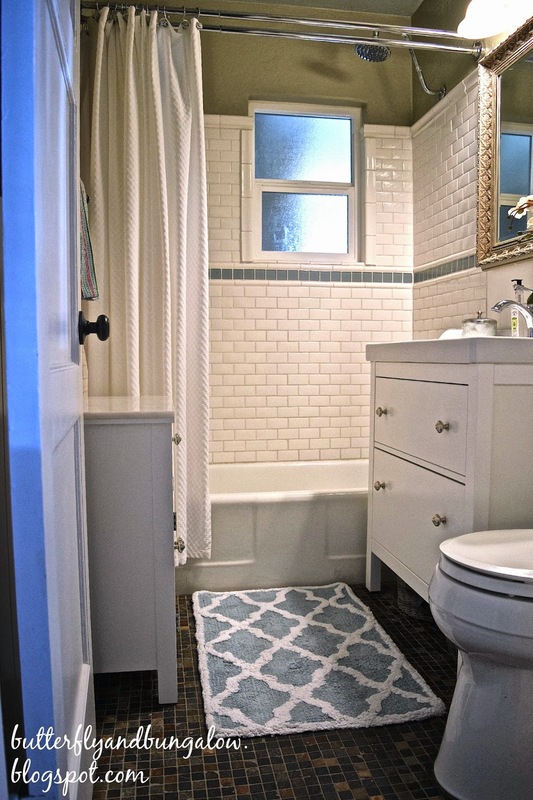 Your bathroom makeover is both beachy and cottagey. Thank you, Joanie. When you walk into a home one kind of has to see it in the future, but I know that is hard! My spouse didn't even look at this house when it was for sale, because he can't tell. He just took my word that I knew what to do, and the inspector's. That's one of the reasons I started this blog. I love older homes, and there are so many older decent neighborhoods with affordable homes that need some fixing, and it is convenient to live in the city. This is the second home I gutted, and we have even built, but the two older homes that I fixed are my favorites, because they are quirky and turn out unique. Have a wonderful day. Beautiful, Su! You guys did an amazing job. No matter the label, it is lovely. Our bathroom needs a major overhaul and neither of us is capable of what is needed. Thank you, Carol. My spouse's father was a carpenter, so he grew up working with him, but he became a chemist. So, he is meticulous, if you know what I mean. My father was a plumber, and if he took me to one of his jobs, I would watch, and I loved seeing the inside of homes. So we both come from "fix it" families, so we make a good team. That should be "so (my spouse) grew up working with his father, but he..."
Thank you, Susie. Have a wonderful week! Beachy or cottagey I think it's just peachy! lol! I chose cottage really, because I love that look and live no where near a beach. But, it surely could go either way. Love the Ikea vanity and the cabinet from Home Goods! The storage area is just perfect! Thank you, Vee, and have a wonderful week. How lovely to have a refreshed 'new' bathroom. 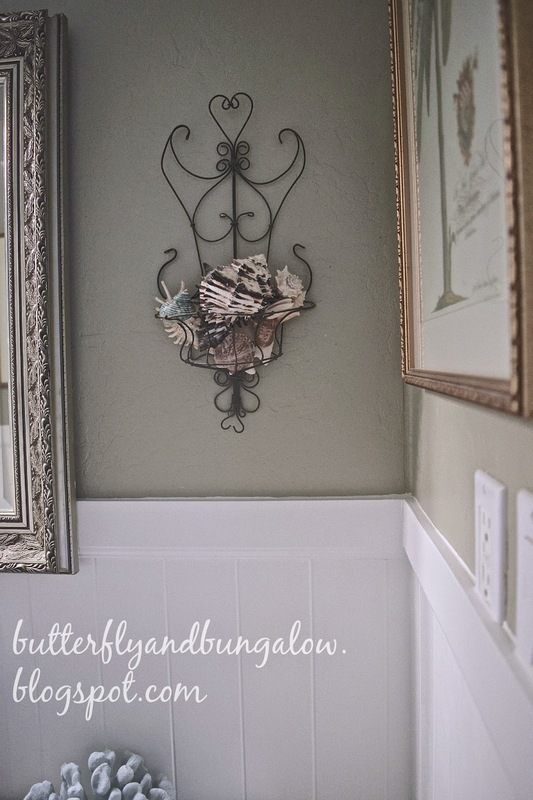 I think it is coastal cottage in style and my favorite part is the tile floors! 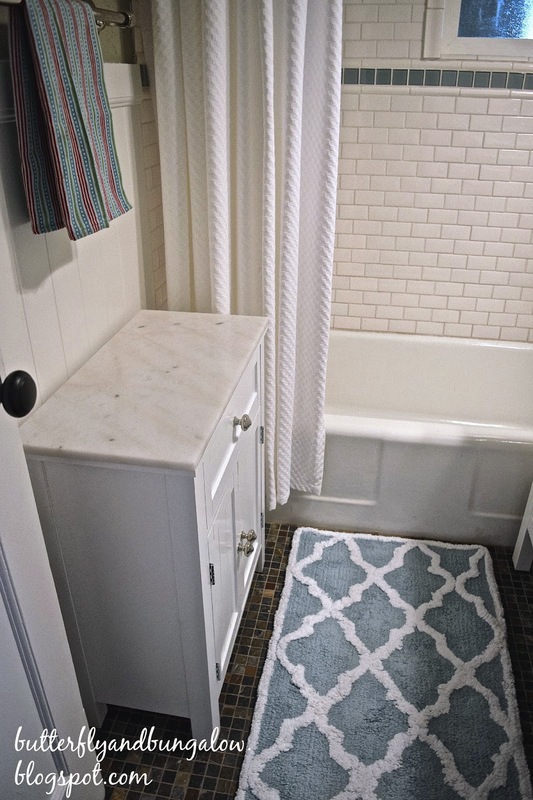 The tile goes so well with your new wood like tile floors in the rest of your bungalow. It all turned out beautiful Su. Storage is not easy; and I'm still trying to live with less after almost three years. Lovely transformation....Coastal or Cottage, you have it covered with all of your lovely details. You have lovely taste and it is a beautiful room. That Ikea vanity and sink top are stunning. I may have to go and peek, great look!! Thank you, Kim. It is really a nice look for the price. The sink is porcelain. It gives us more space on the floor than some of the other off the shelf ones that we could buy. Plus, something custom would cost and bit more, and off course, PB and RH have become so expensive. Oh it looks beautiful! I'm loving the new vanity, it looks gorgeous and so beautiful for a cottage style decor! Thank you, Jennifer. Ikea has some really great ideas. new follower. Love your style! Thank you, Gwen. I followed you too, via Bloglovin. I love what you did to your kitchen. Great choices. Unfortunately, I can't leave a comment on your blog, because I cannot fix my wordpress. If you had G+, I think I could leave a comment if I add you to my circle. Beautiful bathroom redesign. It has such a cottage feel and beachy too. Love the cabinet your found to coordinate. Lovely room so fresh, clean and gorgeous. Thank you. I was hoping to find something white, because it is an interior bathroom with not a lot of light, because the porch is where the window is. 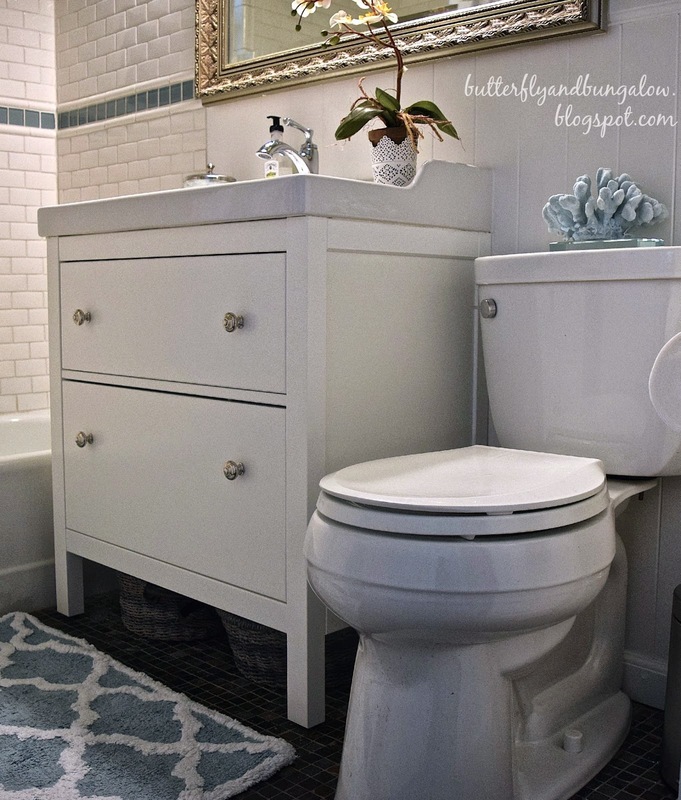 Your redesigned bathroom is so well organized and looks great. Lots of storage. Thank you, Carla. I really like the white, because it's brighter now. The porch is behind that window, so it doesn't get a lot of natural light. Have a beautiful weekend. How fresh and pretty it looks. You must feel so happy every time you look at it. Oh, my! I love you! I've been looking for a bathroom cabinet and sink for months and I never thought to check Ikea! But I really love the one you chose. I'm off to check the site to see if they sell it in France. Your daughter is right, it gives a coastal look to your bathroom and I appreciate that you made me notice how convenient the sink was with its little back! Thank you, Magali. I've been studying French, so I quickly looked too. They do; I saw it in two sizes there. I think there were three here, because one was too big. They also have the sink with the back, and the sink with the back with two basins, not a choice here. They also have another style not available here that looked cottage, if you change the legs, or the natural wood one if it is painted a color. I hope you find one that works! Gorgeous!! I love this look! You did an awesome job!! Thank you, Benita. Have a wonderful weekend. Thank you, Dee, for such a sweet message, and likewise. I am now a new follower of yours. xoxo Have a wonderful weekend. 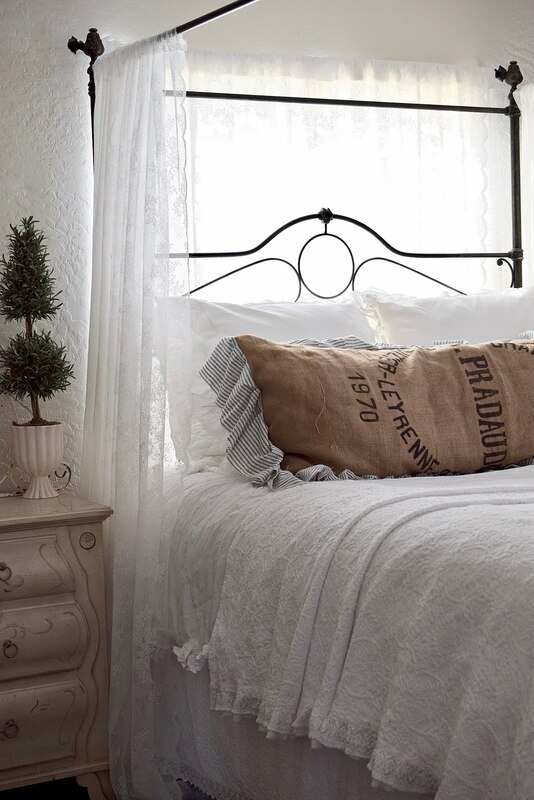 I love it's cottage chic feel, so serene and peaceful here. So need my bathroom done. You have a wonderful space to escape to, soak up its spa like feeling. Thank you, Dore. It's such a small space and the only bathroom, that I am glad that it is more functional and neater. My spouse and I did all the cosmetic work this time and the last. It wasn't too expensive, because we didn't move any pipes, and we chose stock, classic finishes. Nothing trendy... It saves quite a bit. We put the aqua glass stripe around the inside, because old bathrooms that have not be repaired around here have a stripe of a different color; we tried to give it a nod to the past with something fresh. Your bath is just adorable. You are so good at decorating and could make any room look amazing. It looks fantastic! I really like the new vanity...I think it is nice that they are making them to look like pretty pieces of furniture now. And even nicer that the drawers are actually functional! The redo is beautiful, light and airy. I love that sink top and also like the window. Too many bathrooms have no window. This is pretty, and those prints complete the theme. Wow you did a great job.I love the new look....the new sink is beautiful<3 .We need to remodel our bathroom too...hopefully this summer.I hope ours gonna turn out as nice as yours. Fantastic job on the makeover on your bathroom!! I love everything about it. Thank you so much for sharing all the photos!! I love your new bathroom. It is bright and beautiful. I love the tiles and new vanity. Nice work. Enjoy your new pretty space. Thank you, Janet. I'm happy that it turned out so well. Thank you, Lindsey. Have a wonderful week. I think the new vanity is perfect. Even more, I love the sink. Looks amazing. Thank you, Daniela. The sink has a better configuration for a small space than the last one. It may be small, but very charming. I love the mirror and the new linen closet, the colours and..simply everything. Thank you, Sarah. I've had that mirror a long time. Very pretty, clean and fresh! Eu usei Traduz Google, porque eu só posso escrever frases em francês e Spansih. Muito verdadeiro. Aqueles que esperam o mínimo raramente são decepcionado. Obrigado. I remember when you redid the bathroom, I loved it then and I love it now. I have a small bathroom as well that I need to renovate but the budget is not available this year so I will have to wait. I love the fact that yours still looks so fresh and great with simple touch ups 3 years later. Your bathroom is beautiful. I love the new vanity. Really its looking so different from any other bathroom deigns I really like the architecture of the bathroom. Really nice. Thanks for sharing the new design trend of the bathroom. Gorgeous talent! I love the brightness of your bathroom. Just amazingly beautiful. Thanks for sharing! It is wonderful and great bathroom. The Tiles or Flooring Design are so attractive deferentially people love this type of bathroom or homes.